When I travel I love to sketch in watercolor. When I go to a new place I'm always torn, do I explore more or take the time to sit down and do a sketch. My daughter with her dry sense of humor, coined a phrase, when I schlep all my sketching stuff around, all day to never sit down and do a sketch, says, "Well today it looks like you did more performance art than real art!" Apropos for someone who actually is a performing artist and sometimes a smart @#%. Sometimes you just feel more compelled to explore. But there are the times when you purposefully set out to sketch or as you are exploring feel compelled to capture something. I love the process so I like to take my time and not rush through the sketching experience. I can take anywhere from one hour to two. More than two hours is pushing it for me. I can zone out and focus on what I'm doing, but I'm still able to enjoy the ambiance of my surroundings, especially sound. I'm focused visually on what I'm sketching of course but the sounds are an extra bonus. Sometimes not though, I've started sketching only later after I've gotten started to be accompanied by tree trimming, mowing and leaf blowing! Not so much of this traveling though. The locations I recently sketched in Venice, I heard the water lapping in the canals, gondoliers, children playing in the squares, church bells, cafe noise, and a din of Italian being spoken. All of this just enhances and makes sketching more enjoyable. Then there are the smells, if you are sketching at or near cafes, it hard to stay focused if you are sketching before lunch! All the senses for me are engaged while sketching, sight, sounds and smells. When I get home and look back at my sketches I can recall all these experiences, something a photo can never do, because we take the photo and move on. Sketching forces you to be present and experience our surroundings. I go Savannah quite often, my daughter is a student atSCAD, (Savannah College of Art & Design.) Every visit I always go to the SCAD Museum of Art if there is something new to see since my last visit. Last time I was blown away by Dustin Yellin’s Triptych. This last visit did not disappoint either. Aside from an Oscar De La Renta retrospective, the thought-provoking art of Xu Bing, Things Are Not What They First Appear, was a major highlight. There are two different projects, one in the lobby and another in the farthest room from the entrance. This post covers the project in the lobby. I'm standing next to the back of the piece to give a sense of scale. Works in the lobby are from the Background Story series. The main piece, Background Story: Double Ninth Festival Landscape is an almost fifteen feet tall contemporary interpretation of a landscape from a painted scroll from the Qing dynasty. 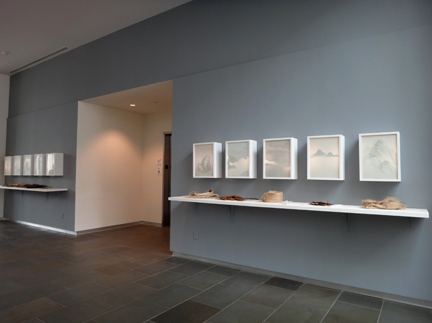 Viewing the work from the front it towers in the lobby and is a large surface of backlit frosted glass, with the atmospheric scene of a traditional Chinese landscape typically done in ink and watercolor. On viewing the rear of the work, I was absolutely astounded as to how the work was created. Essentially it is one huge light box with the clever use of materials one would never expect: plastic grocery bags, dried leaves and twigs, bubble wrap, and torn newspapers to name just a few items. All are recycled or discarded materials. The second installation is small light boxes lining the wall with a single element normally seen in a traditional Chinese landscape. Underneath the box is the material that was used to create it. Most are natural materials aside from the blue plastic shopping bags that were used to create the fish image. 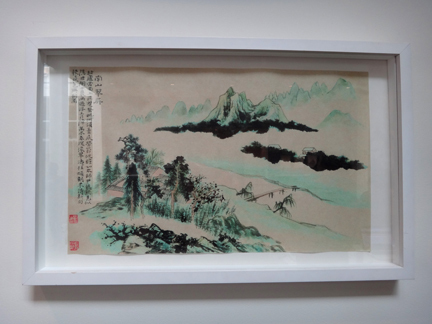 The third piece is another representative copy of a traditional Chinese Painting by Zhang Daqian, The South Mountain Landscape. The blue tones you see in the front are achieved with the same blue shopping bags in the back. Again the images are created with trash and natural debris. Background Story: The South Mountain Landscape back view. I love when artists re-purpose materials to create a new vision! Xu Bing is a Chinese born artist who lived in the United States for eighteen years. He currently resides in Beijing and serves as the president for the Central Academy of Fine Arts. You can visit his website here. The Xu Bing, Things Are Not What They First Appear, exhibition will be at the SCAD Museum of Art until July 3, 2015. If your are not Facebook friends with a lot of artists, you may not know of the Three Paintings in Five Day Challenge that has been taking place since the first of the year. It’s amazing how an idea can become viral, but on the plus side it has been wonderful to see so much art from artist friends flooding the ethers. The idea is to postthree of your own paintings in five days and then challenge an artist to do the same on each of the five days. Then they do the same challenging other artists and so on and so on. I’ll be curious to see how long these continue in my News Feed! I was nominated by good friend and wonderful watercolor painter Carrie Waller, if you haven’t seen her work you must. I finished the challenge last week but for those of you whom I am not friends with on Facebook, I thought I would post here on the blog what I did on Facebook. I’m starting out with a few oils. These were inspired by my time living in Hong Kong. The two temple paintings have actual worshipping papers in the background. The market painting is of one of my favorite vendors in the wet market in SoHo, a mother and daughter that sold only bananas and peanuts. I challenged all my Florida Watercolor Society friends who hadn't been challenged yet.